At the 15th Symposium on Polymers for Microelectronics held last week in Wilmington DE, TSMCÃ¢Â??Â? ?s Doug Yu, Sr. Dir. of front end and back end technology development, challenged the current nomenclature for interposers and suggested that the more versatile interposer technology should be called 3.5D instead of 2.5D since it is, and will be, capable of much more than the simple 3D stack. The term 2.5D is usually credited to ASE’s Ho Ming Tong who ~ 2009 (or even earlier) declared that we might need an intermediate step towards 3D since the infrastructure and standards were not ready yet. 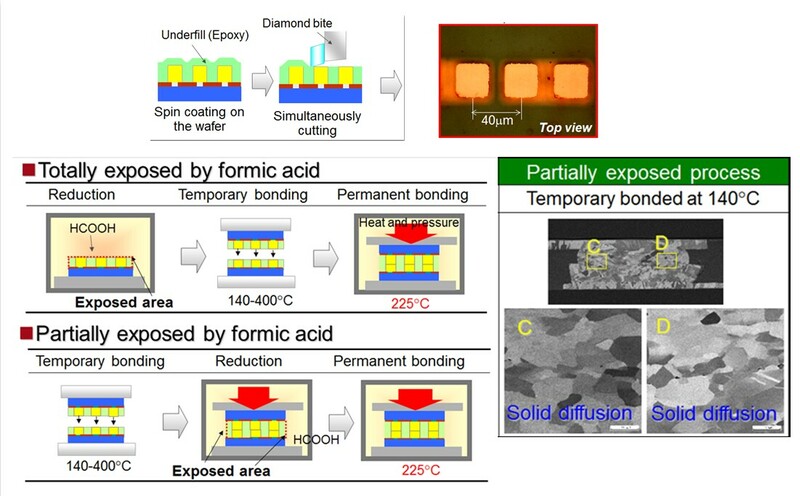 The silicon interposer, Tong felt, would get us a major part of the way there, and could be ready sooner than 3D technology, thus the term 2.5D, which immediately caught on with other practitioners. Yu’s new position is that interposer technology actually is more versatile and thus should be called 3.5D since it not only offer a better thermal solution than 3D, but "…can some day replace most of the high density PC boards." 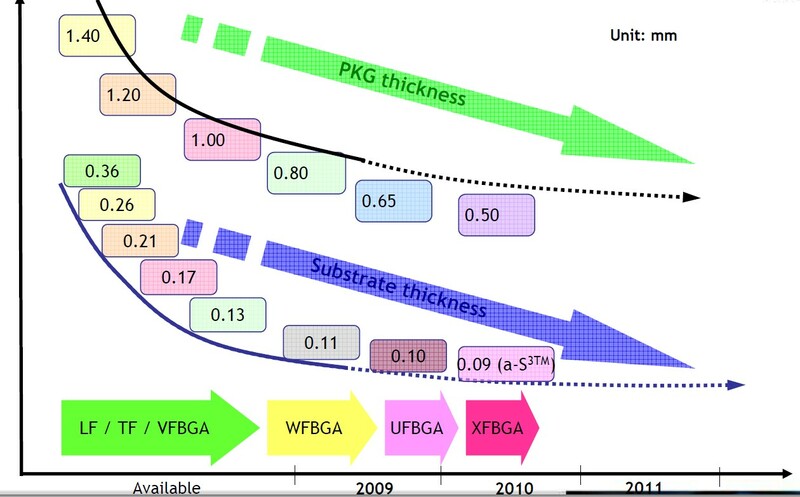 Yu’s position is that this modular silicon technology will need minimum low density PCB substrate to connect the functions that have been fabricated on silicon and will be, in essence, the perfect "fab centric" solution. Yu proceeded to show how future smartphones and tablets could be made up of such simple 3.5D silicon modules. More from the Polymers for Electronics meeting coming soon at IFTLE. GLOBALFOUNDRIES has announced the installation of TSV production tools for the company’s 20nm technology platform. CTO Bartlett announced that they were "…engaging early with partners to jointly develop packaging solutions that will enable the next wave of innovation in the industry." The first full flow silicon with TSVs is expected to start running at Fab 8 (Saratoga NY) in Q3 2012 with mass production expected in 2014. GF is also preparing for a 2.5D line within its Fab 7 facility in Singapore with a similar time schedule as the 3D line in the United States. While arch competitor TSMC has announced a one-stop-shop turnkey line which includes all of the assembly and test steps traditionally handled by the OSATS [see: "TSMCrepeats call for foundry-centric 2.5/3D industry"], GF proposes to handle TSV fabrication (Cu , vias middle) and other front-end steps while typical backend processes such as temporary bonding/debonding, thinning, assembly and test will be done by their OSAT partners such as Amkor [ see IFTLE 65 "….. GLOBALFOUNDRIES Packaging Alliance…" GlobalFoundries reports that they will define a PDK with its partners, initially they are looking at 6 um vias on a 40-to-50um pitch. At the recent Intel analyst day CEO Paul Otellini CEO predicted that the increasing cost of manufacturing in the IC industry would result in consolidation that will "…only leave two or three companies at the leading edge of chip design." Otellini reports that "Gordon Moore predicted a thinning out of chip fabrication facilities once the cost of a new 200mm wafer manufacturing plant hit $1bn, but he was a little too early." With the cost of a 300mm fab expected to exceed $5B at the 28 nm node and 450mm wafer fabs that are projected to cost more than $10B apiece few companies will have enough volume to absorb such costs. Readers of IFTLE know that we have been predicting this outcome for several years [ see PFTLE "IC Consolidation, Node scaling and 3DIC". Nice to see that Intel agrees, although this will severely limit options for customes of the latest node technologies. Memory - Samsung, Toshiba, Micron/Elpida, Hynix ? That’s less than 10 total players on the leading edge moving forward. Better start getting used to it ! For all the latest on 3DIC and advanced packaging stay linked to IFTLE………………. At the 15th Symposium on Polymers for Microelectronics held last week in Wilmington DE, TSMC’s Doug Yu, Sr. Dir. of front end and back end technology development, challenged the current nomenclature for interposers and suggested that the more versatile interposer technology should be called 3.5D instead of 2.5D since it is, and will be, capable of much more than the simple 3D stack. Continuing with our examination of advanced packaging at the 2012 IMAPS MINIPAD. ST Micro reported on stress induced fine pitch copper pillar failures. Compared to solder bump, Cu pillar bumping is known to possess good electrical properties, better electromigration performance and better thermal fatigue resistance . 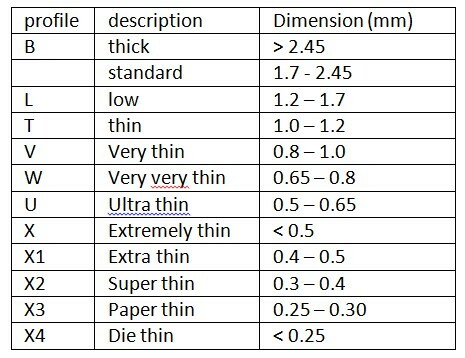 The only drawback is that Cu pillar bump can introduce high stress due to Cu higher stiffness compared to the solder material. Therefore, the stress induced failures become a major issue when Cu pillar bump is built on low k or extreme low k (ELK) chips. 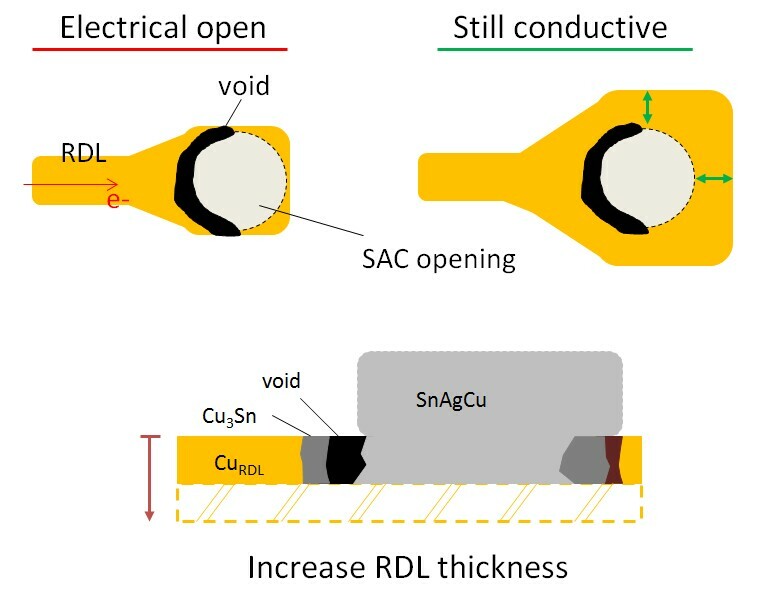 In this ST Micro study, fine pitch copper pillar has been assessed vs polyimide effectiveness for fine pitch Cu pillar interconnections having small pillar diameter. Vehicle1 (package 2 configuration) used extreme lowk ILD materials. 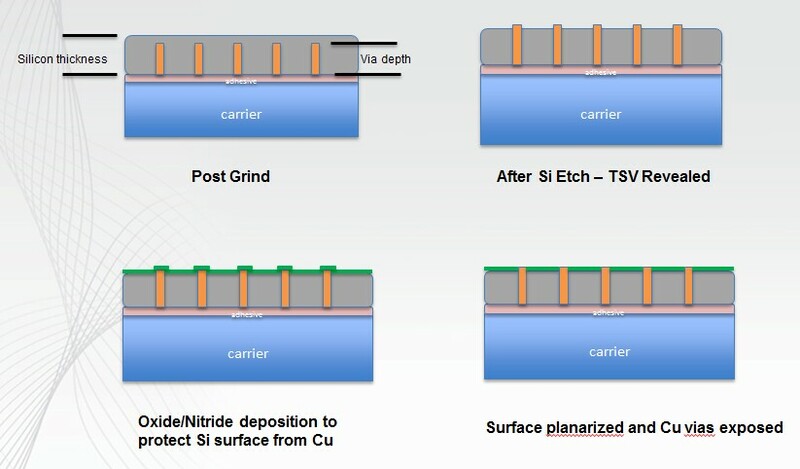 Die were attached on the substrate without underfill and underwent several die attach reflow cycles to induce failure and define the more robust configuration. The no PI leg did not evidence any defect up to 20 reflows but the PI passivated leg showed 100% failure after 20 reflows which appear to be stress induced failures ( likely to be crack in aluminum pads ). Results after reliability tests show that the implementation of polyimide for fine pitch Cu pillar is not obvious. 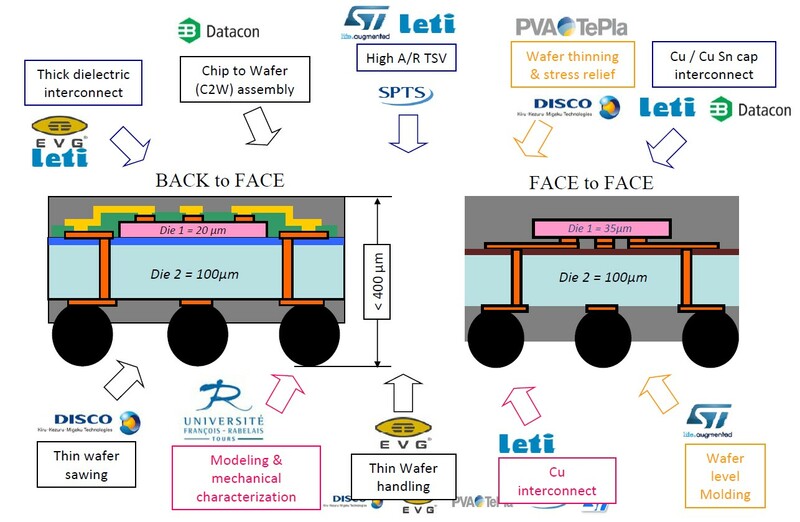 Thus, in the case of PI configuration, failure analysis reveals three main failure modes: delamination at the Bump/PI/pad and copper stress voiding in the pad metal in stacked vias structures, both occurring during thermal cycles. Delamination in the low-k layers has been also found for the highest die size in the PI configuration. All those analyses have revealed that for the tested configurations, higher stress has been observed with the PI configuration compared to the no PI one. FEA was done to better understand these results. In the No Polyimide configuration, the stress is spread along the pad structure thanks to the higher copper contact. 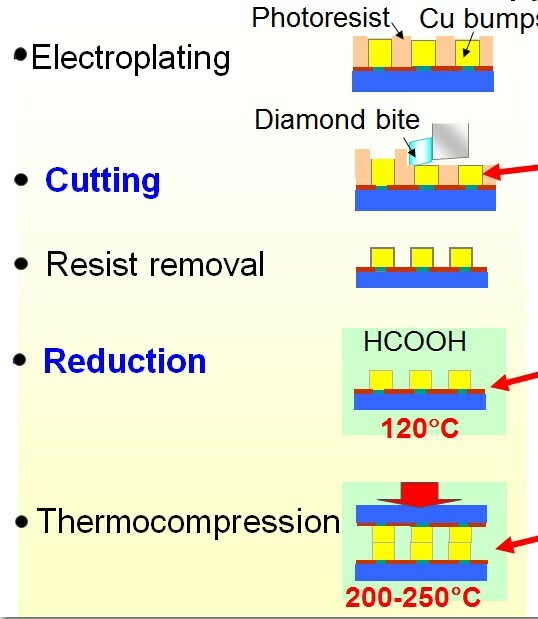 Indeed, the passivation layers (i.e. SiN and PSG layers) have sufficient mechanical properties to transfer the stress to the beneath layers. In the PI configuration, high peak stress is observed beneath the Copper/Aluminum interface. On the contrary, in the No PI configuration, the stress is spread along the pad structure thanks to the higher contact of Copper pillar bump. 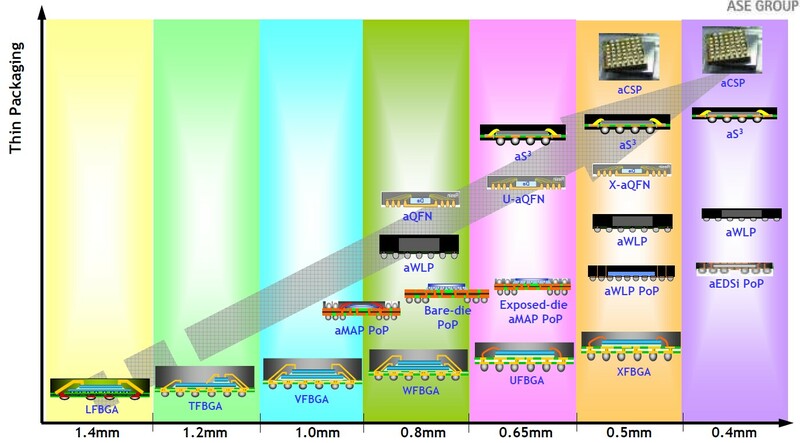 STATSChipPAC looked at some "Advanced Ultrathin eWLB-PoP solutions." 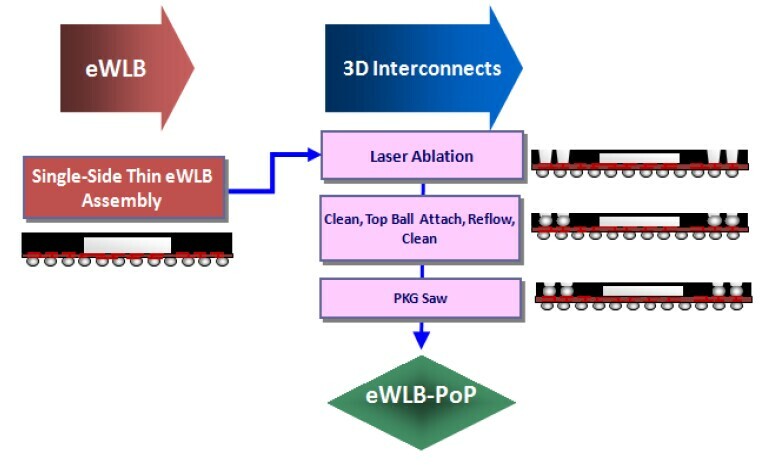 eWLB has been introduced into production to allow for higher ball count WLP, by extending the package size beyond the area of the chip. There is also great opportunity related to a 3D variation of eWLB which would allow for mounting of components or another package on the top surface with thinner profile and PoP (Package-on-Package) technology. The table below shows reliability for such stacked test vehicles. 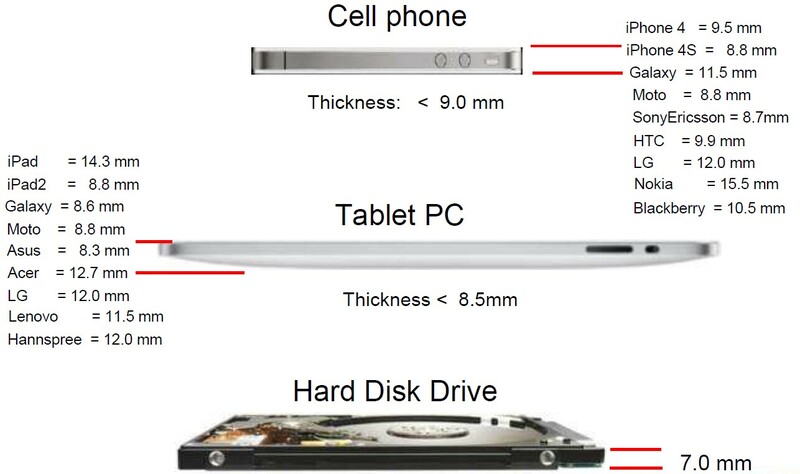 Bernd Appelt of ASE continued the theme of thinner is better with his presentation "Ultra Slim Packages with Ultra Slim Substrates" There is no question as the figure below shows devices continue to get thinner. The ASE embedded technology a-EASI (adv embedded assembly solution integration). They are undergoing customer evaluation with embedded actives and passives. 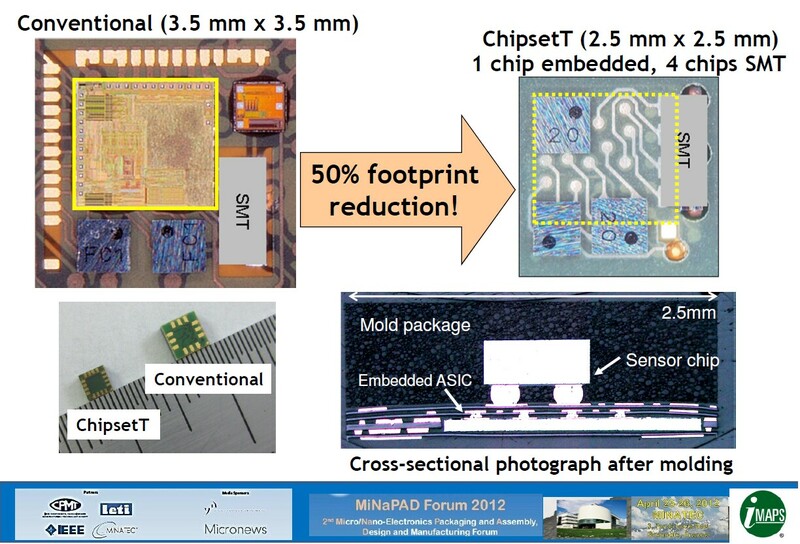 Below we see a nice example of what can be done with this technology, i.e a 50% reduction in footprint by embedding the ASIC die. For all the latest in 3DIC and advance packaging stay linked to IFTLE…………………. Dr. Phil Garrou has been blogging for years on the evolution of semiconductor assembly and packaging technologies. In his first 100 blog posts, he’s covered the emergence and explosion of 3D packaging, and most recently, the "2.5D" innovation of interposers. IMAPS France held the 2nd Micro/Nano-Electronics Packaging, Assembly, Design and Manufacturing Forum (MiNaPAD) in Grenoble in late April. Jean-Marc Yannou, President of IMAPS France gave a Yole market update on 3DIC and TSV interconnects indicating that Wafer-level-packages are the fastest growing semiconductor packaging technology with more than 27% CAGR in units and 20% in wafers over the next 5 years to come. Yannou also repeated rumors that "Power 8 by IBM believed to be based on 3D interposers; Haswel, Intel GPU on 2.5D interposers for laptops with lots of on board memory and ultra large data bus. " Leti gave an update on the 3DICE program being done under the European Unions 7th Framework with partners Datacon, Disco, EVG and ST Micro. Below find the unit operations that are part of the program and those responsible. They have concluded that B2F has less operations and is easier to accomplish than F2F. Back to face attach can be done with die attach film, full sheet bonding layer or patterned bonding layer. B2F pick and place with a Datacon 2200 can reportedly handle 20um thick die with 7um accuracy in 3 sec. 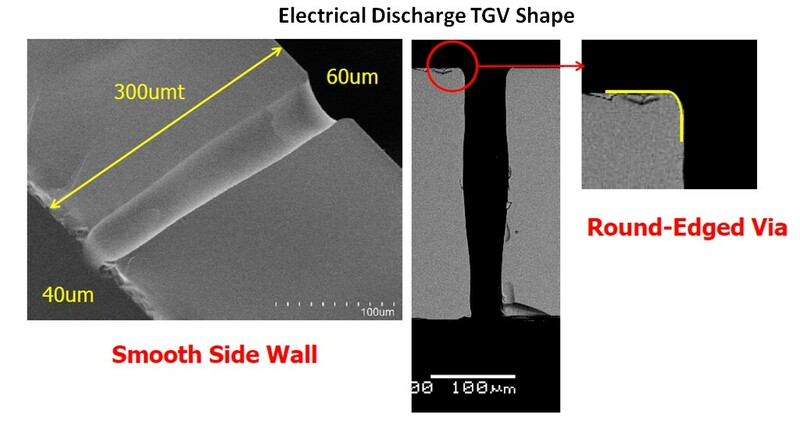 Plasma stress relief allows for thin die handling by increasing die strength. Thin die encapsulation can be accomplished in several ways i.e by conformal CVD deposition (oxide or parylene), by spin/spray coating of solutions (BCB, PI, ALX) or by film lamination. Die are bevel cut at 45 degrees to make subsequent metallization easier. Thermo-mechanical stress in these combinations were examined. EVG gave more details on the release process for their ZoneBond TB/DB (temp bond/debond) process. The anti sticking layer showed a temperature stability up to 300C for 20 min. 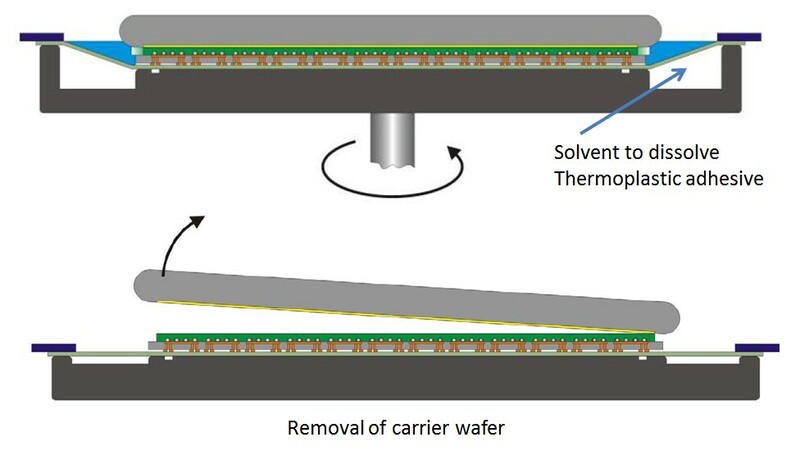 Carrier wafers were bonded and debonded 25x. 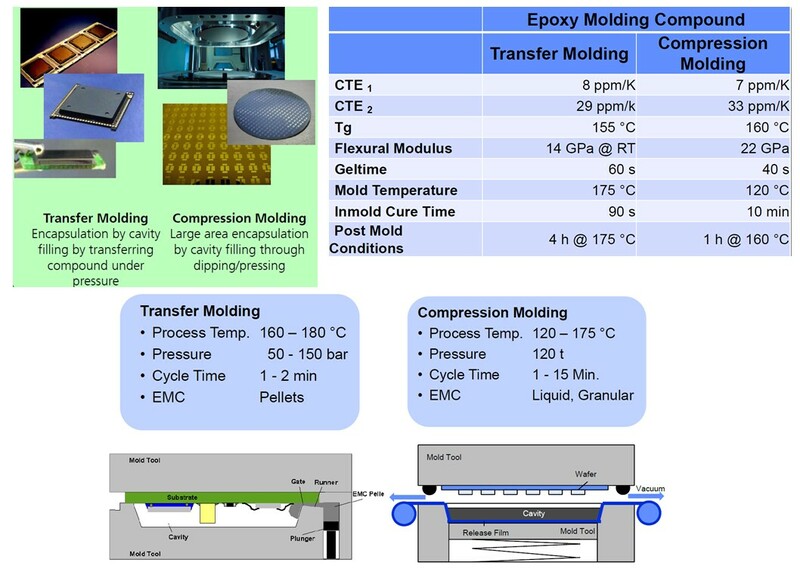 technologies - A new way for system integration" specifically looking at options for today’s transfer molding and compression molding technologies. 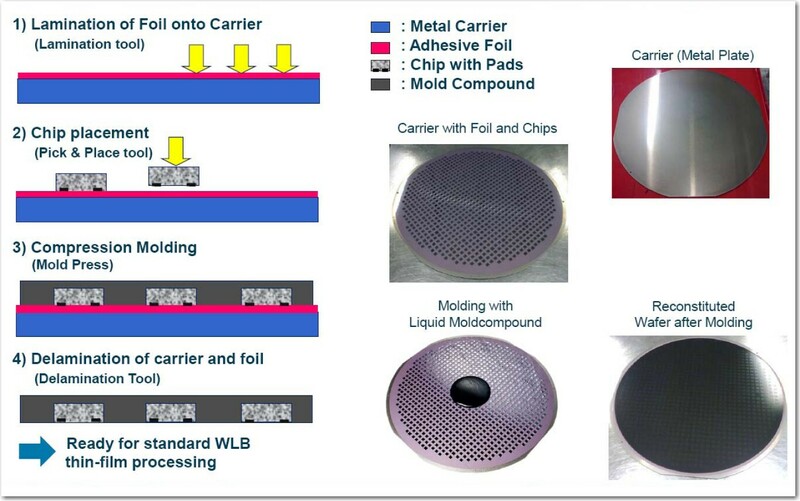 While transfer molding has been used for years to make plastic packaged parts, compression molding has recently become in vogue as part of the embedded chip technology package, i.e molded reconfigured wafers. They propose the following roadmap for system integration with molding. ST Micro presented some electromigration details on SnAgCu interconnect for WLB packages. Since the electrical opens are due to voids at the RDL/solder interface a solution is to insure that the enclosure around the solder ball is large enough and increase the RDL thickness as much as possible. 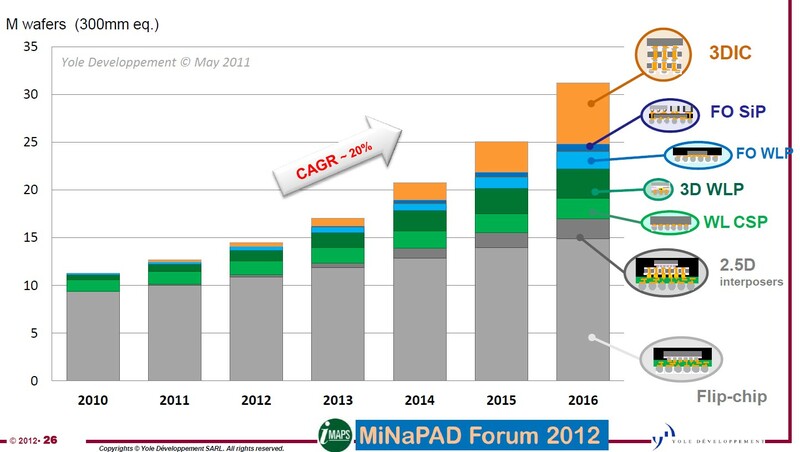 We will have more MINAPAD review in next week’s IFTLE. For all the latest in 3DIC and Advanced Packaging stay linked to IFTLE……………………..
1. Apple and TSVs, top chip makers, and "betting the ranch"
While Insights from the Leading Edge covers a great deal of 3D packaging news, that doesn’t mean that there are no other very significant packaging evolutions and market opportunities going on at the same time. Certainly the LED space is one of those, Dr. Garrou said, and readers agreed. Lester Lightbulb has become something of a favorite character on Insights from the Leading Edge, as Dr. Garrou carries out an in-home energy/cost savings analysis of conventional incandescent lightbulbs, CFLs, and LEDs. In the fall of 2007, Toshiba first announced the commercialization of TSV in a CMOS image sensor (CIS). The next step of circuit repartitioning and stacking was interrupted by back side imaging, which flipped the chip over and let the light enter through the least obstructed side to let more light in per pixel. Now, we consider today’s CIS advances. The cellphone continues to pull in the functionality of digital cameras, PDAs, GPS navigators, mobile TV and numerous other applications. It is quickly becoming the dominant market driver for virtually all of these functions. Garrou reviews Xilinx’s new FPGA, with 10,000 connections on a silicon interposer, using "2.5D packaging." 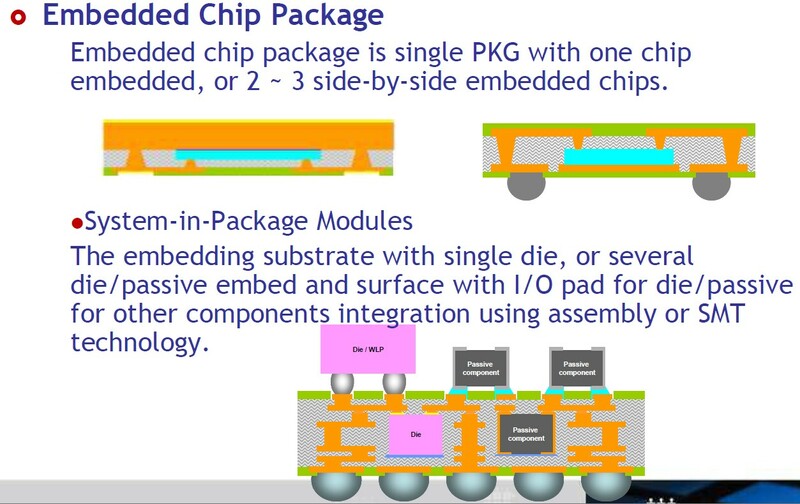 Reporting from MEPTEC and SEMI’s "2.5D, 3D and Beyond Bringing 3D Integration to the Packaging Mainstream" Conference in 2011, Dr. Garrou shares highlights from Amkor, GLOBALFOUNDRIES, and other presenters. Dr. Garrou looks at packaging activities at the 2011 ECTC, including presentations from Qualcomm and STATS ChipPAC, Fraunhofer IZM, Xilinx (interposers! ), and others. Dr. Garrou shows us the evolution of TSV from 1999 through to today, checks in on MU’s HMC, and analyzes some recent packaging news. Garrou explains the variety of 3D packaging terms with a little help from "Raymond J. Johnson Jr." He also notes Canon’s back-end equipment entry. Here’s to 100 more Insights from the Leading Edge blog posts! You are currently browsing the Insights From Leading Edge blog archives for May, 2012.